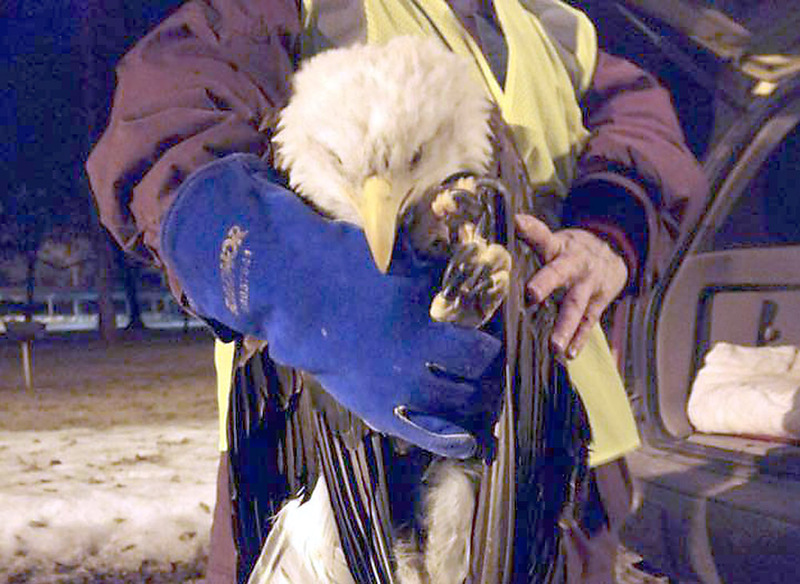 Animal handlers capture an eagle that had been found on the ground Feb. 14, 2017, in Kaukauna’s La Follette Park. KPD photo. KAUKAUNA — Despite receiving care overnight at Bay Beach Wildlife Sanctuary in Green Bay, the bald eagle rescued Tuesday, Feb. 14, 2017 from La Follette Park has died. Bay Beach officials made the announcement Thursday. Officials haven’t confirmed a cause of death. The sanctuary is working closely with the Wisconsin Department of Natural Resources and the U.S. Fish and Wildlife Service Midwest Region on next steps. If they are able to determine the exact cause of the death, they will share the findings. The bird apparently had been on the ground in La Follette Park for several hours when neighbor Karen Barto noticed it and called the sanctuary in Green Bay. Staff from the sanctuary then contacted Kaukauna police Tuesday requesting assistance, and the bird was captured about 8 p.m. that evening, according to Assistant Chief Jamie Graff. Officers snapped a quick photo of the eagle before it was transported to Green Bay and posted it to the department’s Facebook page where it quickly was shared throughout the Fox River Valley. “We are currently giving the eagle supportive care with fluids and oral feedings and have it under observation,” said senior animal keeper Matt Rupnik after the bird arrived at the facility. Rupnik said the bird is a mature adult bald eagle, approximately 5 years old. The gender is unknown at this point. When the eagle was admitted to the sanctuary it was of good weight with no noticeable injuries found, but was noticeably weak with a slight head droop. Bay Beach Wildlife Sanctuary treats anywhere from two or three eagles per year to as many as 10. Rupnik reminds residents that if they are concerned about an animal in their yard or area, contact the Bay Beach Wildlife Sanctuary anytime between 8 a.m. and 4:30 p.m. daily at 920-391-3685.